Many veterinarians will agree that one of the most common medical problem seen in captive hedgehogs is obesity and obesity related problems. A few hedgehog enthusiasts discourage limiting a hedgehog’s food and claim that hedgehogs will not over eat. However, an overwhelming number of experts and enthusiast disagree. Hedgehogs can overeat even on a low-fat hedgehog diet, so food intake often must be restricted to maintain proper body weight. Overeating of foods too high in fat and protein such as regular cat food and fatty insects such as wax worms, mealworms, and superworms is a significant culprit of obesity. Lack of exercise is also a huge contributing factor. Cages that are too small can limit exercise and activity. However, when hedgehogs are a healthy weight they can become more active by running on their wheel and exploring their cage at night. Some hedgehogs are prone to obesity due to genetic predisposition. There is no standard weight for a hedgehog. The reason being that the sizes vary quite a lot from one breeder to another, so figuring out what is obese can be difficult. The typical healthy hedgehog is actually usually on the plump side but is teardrop shaped instead of round when not balled up. Since there is such a wide variety of size in domestic stock these days, an obese hedgehog can be as little as eight ounces to as much as two pounds in weight, so weight guidelines are of little use in identifying a fat hedgehog! A gram scale is more accurate in measuring weight than a standard bathroom scale. Healthy hedgehogs appear twice as long as they are wide; they are not round in shape. Extra caution is required in weight reduction because a drastic reduction of weight can trigger Hepatic Lipidosis (Fatty Liver Disease). Fatty Liver Disease can be fatal if not treated. Discuss a weight reduction plan with your veterinarian for the best chance of success. This guide can be used as a discussion tool with your veterinarian. Decrease and/or eliminate high fat foods and treats in the diet. Reduce the calories in the diet by switching to lower fat formulas and decreasing food intake. Encourage foraging behaviors by hiding food around the cage instead of using a food bowl. 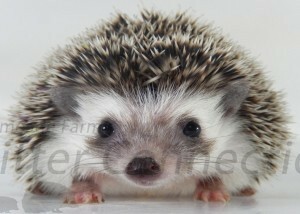 One suggestion given on Hedgehog Central is to actually change the type of dry food that you are feeding to one that has a fat content of at least 20 percent. The theory is that added fat will cause your pet to “bulk-up” and eat less and will actually help it to lose weight. This treatment plan should only be used after all other treatments have proven unsuccessful and with veterinary guidance. A wheel provides exercise and stimulation but lazy hedgehogs may not use it. A new style of wheel may be more comfortable for the hedgehog and therefore increase wheel activity. It is important to ensure that the wheel is the correct size for your hedgehog. Increase the hedgehog’s cage size and time exercising outside of the cage. Letting a hedgehog hibernate is NOT the answer for hedgehogs believed to add weight for winter hibernation. Untreated obesity can lead to an early death due through other health complications. Obesity increases the risk of tumor development. Fatty Liver disease is also a complication of obese hedgehogs without a weight loss plan. Heart attacks are also associated with obesity. This problem is a very common problem with overweight guinea pigs and can happen to hedgehogs as well. One of both eyes can be affected. A low fat diet and additional opportunities for exercise is the best treatment. When the hedgehog loses weight the fat deposits will most likely disappear.